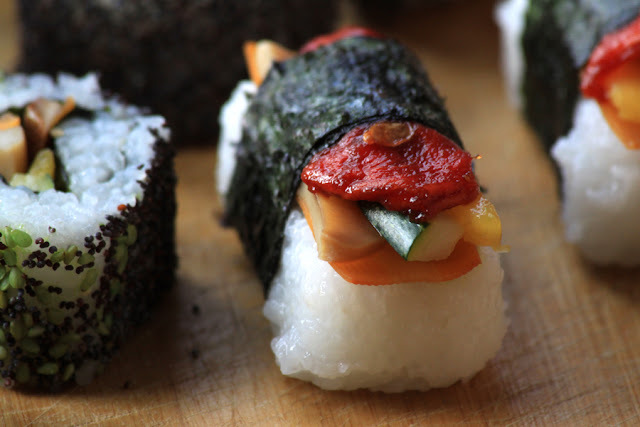 Culinarily speaking (thus not culturally and beyond) sushi is just a rice roll that fits pretty well with anything you want to put on it. 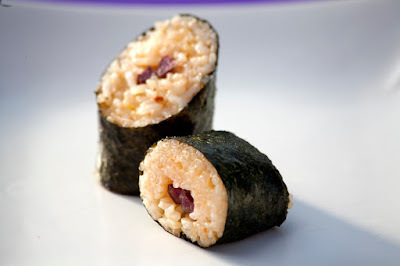 Ideally you would choose a particular kind of rice that is special for sushi: sushi rice. It has a sweeter taste, it gets sticky and the grains keep a pretty round shape after cooking. 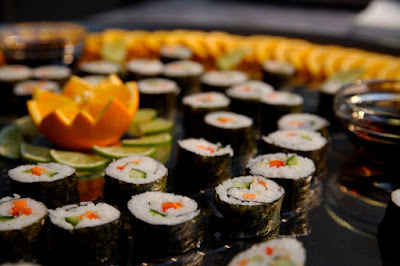 But sushi also works with other regular rice such as basmati, arborio or dessert rice. Do not try it with parboiled rice - it really won’t work. Sushi rice is traditionally seasoned with mirin and rice wine vinegar. The end result is basically a light sweet and sour bland rice which works as a neutral ground that goes together with any other (marinated) colourful additions - e.g. sweet potatoes, cucumbers, carrots, asparagus, avocado, mangoes, strawberries, tofu, seitan, you name it - and wasabi. There are 1001 recipes for making sushi. I find most of them quite bland. So my own version of it will usually include some extra flavourings to make sure the rice is exciting enough in itself. I might, for instance, add kaffir lime leaves and/or lemon zest, or even lemongrass to the cooking water with the rice. I sometimes also add a hint of cardamom, ginger or horseradish to it. The most important to me is that the contrast between sweetness and sourness in the rice gets more prominent. Lastly, a pinch of salt helps to bring up the other flavours to their best. You can fill your sushi with various combinations of ingredients, herbs and spices that you have at home. 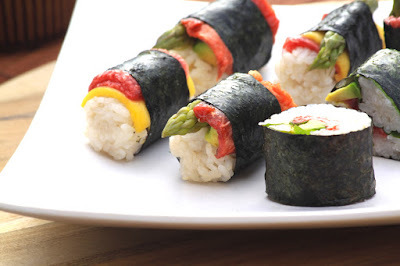 Commonly used ingredients in traditional sushi recipes are: cucumber (cut into strips) (green) asparagus, watercress, carrot (cut into strips), shitake, cremini or oyster mushrooms, pickled ginger slices (oh, these are really great! ), zucchini (cut into strips), avocado, mango, peach, strawberry, bell peppers ... some hard vegetables such as carrots, sweet potato or asparagus are better used after some quick blanching - pay attention not to overcook it. If using plain tofu, press the tofu well for at least one hour before marinating and using it in the sushi. Smoked tofu works very well and it is usually in the ideal consistency for immediate use - no need to press it. You can also use seitan or other plant based special product that you find in your local shops. If you don’t have rice vinegar or mirin at hand you can also use sugar with (balsamic) vinegar. I love using balsamic vinegar or other herbal infused vinegar - such as tarragon - in my sushis. 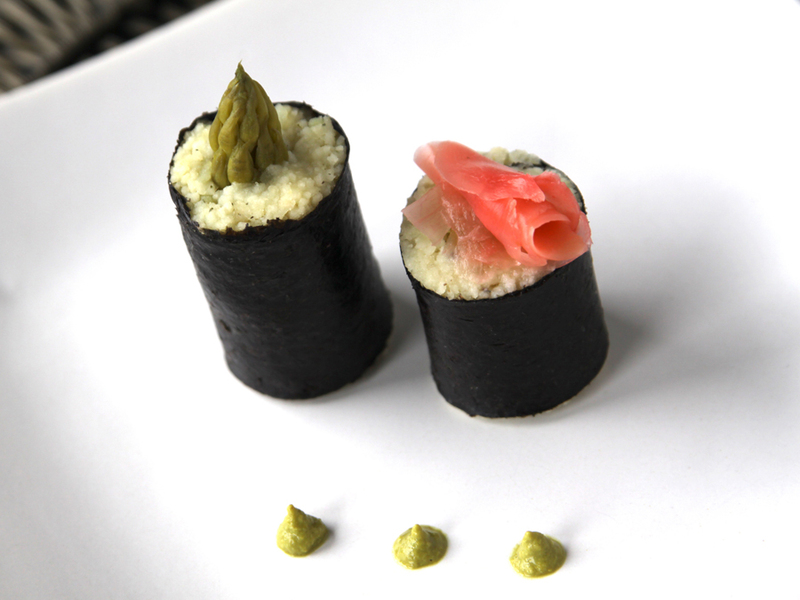 For making the rolls, I recommend that you use a sushi mat, which is a bamboo mat that you use to roll the sushi. If you make inverted sushi, where the nori sheet is on the inside and the rice in on the outside, you should use a food plastic film to avoid the rice to stick directly to the sushi mat. If you wish to bring your sushi to a total new level, try using using dried shitake mushrooms or dried summer fruits. One of my favourite special additions is watermelon. 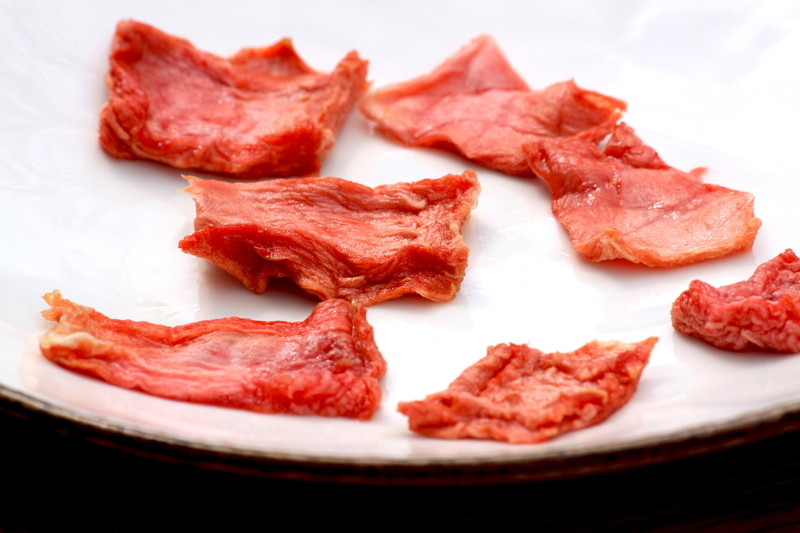 It can be cut into slices of 1-2 cm and dried in a dehydrator at a low temperature. How long it will take depends on various factors such as how juicy your watermelon is, settings of your dehydrator, air moist, thickness of the slices, etc. 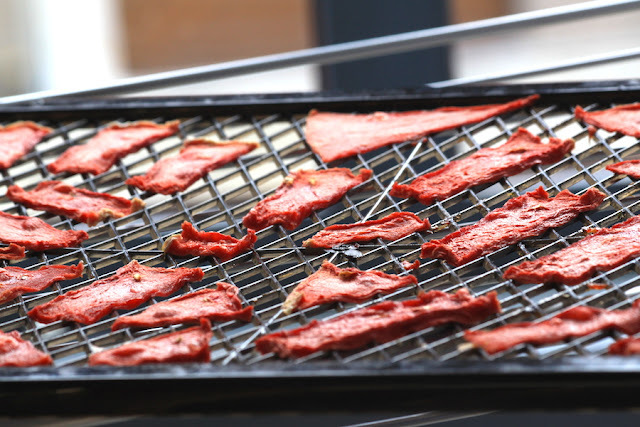 If you don’t have a low temperature dehydrator, you can dry them in a regular oven, at the lowest temperature allowed in it. Place the slices on a silicone thin baking sheet (not regular silicone baking mats). If you bake it in temperatures higher than 90°C you should keep a close eye on how quickly it bakes, as it should not burn. When ready, keep your dried watermelon in air-tight containers to eat as a snack (delicious!) or to be used in salads, sushis or other culinary creations. 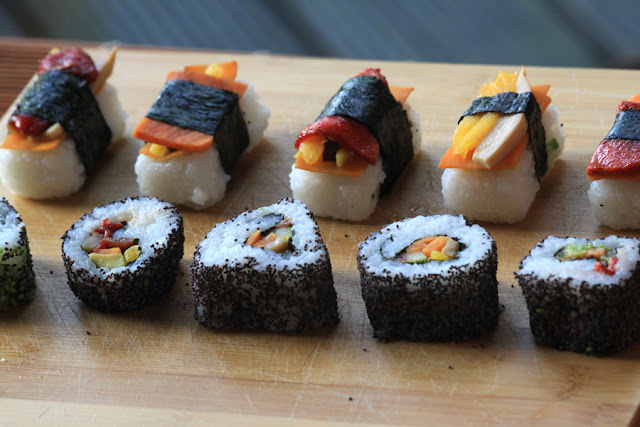 Here is one basic recipe, to help you unleash your creativity and create your favourite sushi. 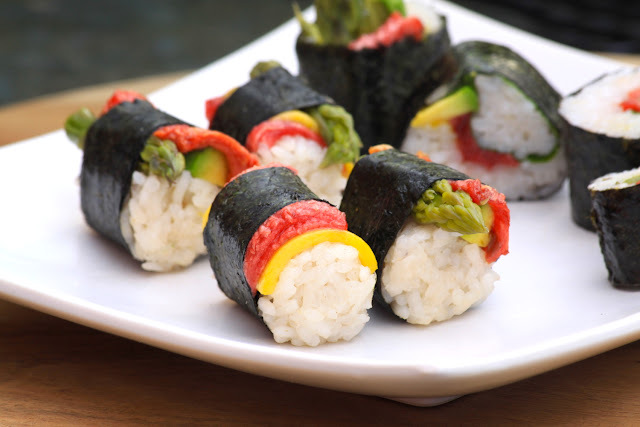 If you don’t have or simply prefer not to use nori sheets, there are plenty of other ways to roll up your sushi rice. Examples: wild leaves (like linden), romaine lettuce, thin slices of courgette/zucchini or carrots, rice paper, sesame seeds (black, yellow or wasabi-coated sesame), nigella seeds, poppy seeds, etc. Rinse the rice several times and drain. Cook the rice with the water until all the water is absorbed (12 to 15 minutes). Cover the cooking pot and allow it to sit for 10 to 15 minutes to cool a bit. Add the mirin (or sugar or sweetener of your choice) and rice vinegar gently through the rice. 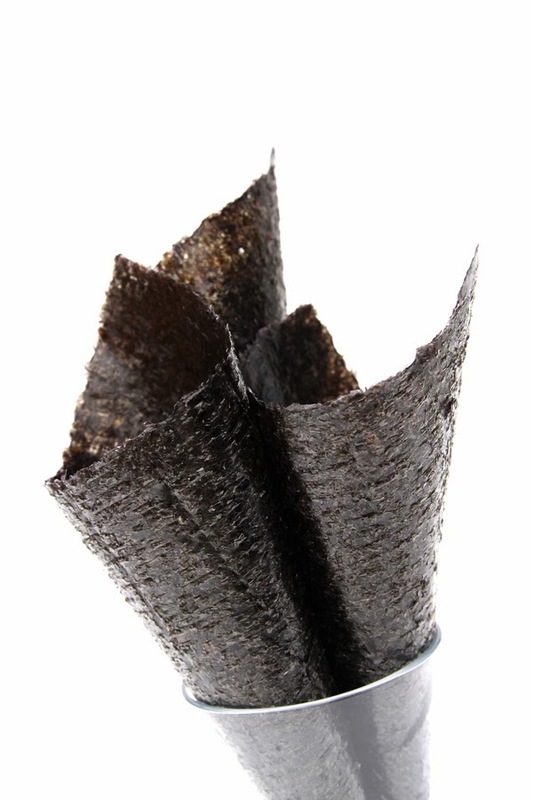 Place a nori sheet on the top of a bamboo mat, rough side up (some people prefer the opposite). Spread the sushi rice evenly over 2 thirds of the nori sheet of nori. Spread a thin line of wasabi paste over the rice. Add your vegetables on top. Roll the sushi by using the bamboo mat. Pressure gently while rolling it. Dip your fingertips in a bowl of water and use them to moisten the ends of the nori sheet, to help it stick to the sushi neatly. If this is your first time making sushi, make sure to cook extra rice so that you can practice a bit until you get the hang of rolling it if you want them looking tight enough. 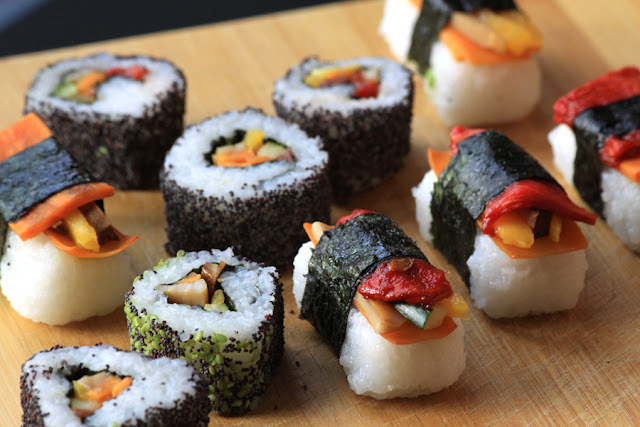 The secret is to spread the rice layer in equal amounts over the surface of the nori and keep pressing it while rolling, so that there is not much air in the rolls - making it difficult to cut nice slices. Leave the sushi rolls in the fridge for at least 20 minutes. Cut them into slices with a very sharp, wet knife. Garnish with a pinch of wasabi and/or pickled ginger. 1) ripe avocado, wasabi, lime juice (or yuzu), lime zest and sea salt. 2) good quality shoyu, lemon juice, agave syrup and finely grated ginger (preferably grated using a Microplane or other similar fine grater) . If you opt for serving sushi with a sauce, make sure to pour these sauces or creamy “extras” in very small pots, so that people know that they should not totally dip each sushi in it - unless you make sure they are mild enough, not too sour, salty or wasabish.